But I would extend the recommendations to eliminate all industry funding of CME. If doctors can’t pay for their own education who can? There are many industry funded chairs at medical schools, like the Novartis Chair at McGill that pays the head of cardiology, that should be eliminated and their endowments returned to the industry donors with interest. Surely, out of the $many millions collected by the cardiology department for various clinical services, McGill can afford to pay a salary to its head. All online drug funded CME, like this, should also be eliminated. AAMC Calls For Strict Limits on Industry Support of Medical Education. Washington, D.C., June 19, 2008-The AAMC (Association of American Medical Colleges) today urged all medical schools and teaching hospitals to adopt policies that prohibit drug industry gifts and services to physicians, faculty, residents, and students, and to curtail the involvement of industry in continuing medical education activities. The recommendations were part of a new AAMC report, “Industry Funding of Medical Education,” unanimously approved by the association’s Executive Council. In adopting the report, the AAMC’s leadership urged all association members to implement policies and procedures, consistent with the report’s guidelines, by July 1, 2009. The report was the result of a 14-month effort by an AAMC task force, established in 2006, to examine the benefits and pitfalls associated with industry funding of medical education, and to develop principles, recommendations, and guidelines to help medical schools and teaching hospitals better manage their relationships with industry. The panel was chaired by retired Merck Chairman and CEO Roy Vagelos, M.D., and the vice chair was William Danforth, M.D., former chancellor of Washington University. The task force membership included institutional leaders, faculty, residents, students, CEOs from the pharmaceutical, biotechnology, and medical device industries, ethicists, and public representatives. 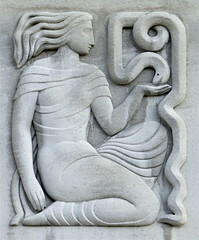 While all medical schools and teaching hospitals do not yet have strong polices governing their interactions with the drug and device industries, many are working to develop them, and a number of academic medical centers have implemented such policies in the past few years, including University of Pittsburgh School of Medicine; University of Pennsylvania School of Medicine; Stanford University School of Medicine; University of California, Davis, School of Medicine; David Geffen School of Medicine at UCLA; and Yale University School of Medicine. We were delighted to be notified of an upcoming symposium on food addiction. 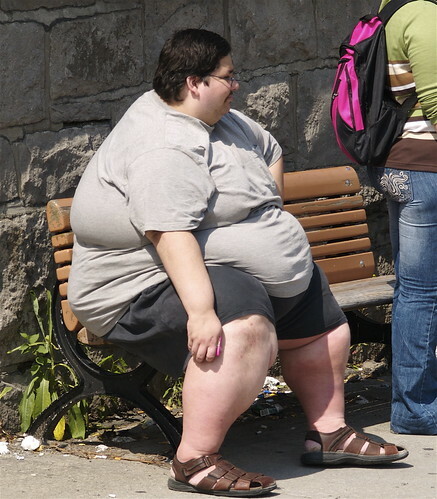 It has finally dawned on the obesity establishment that the pandemic of obesity is caused by the pandemic of food addiction. 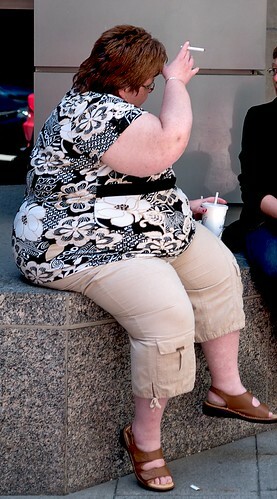 We have been criticized for even making the suggestion, illustrated in our photo essay on food addiction. Now they must start asking themselves why there is a pandemic of food addiction that began in the early 1980s, coincident with the beginning of the promotion of the cholesterol myth. The most likely explanation is the moral hazard effect of drugs for “treating” the symptoms of self-destructive lifestyles. 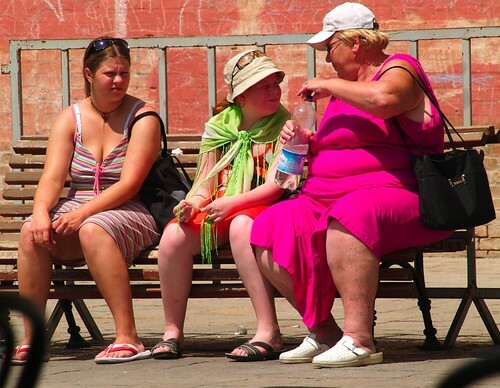 The population has been indoctrinated in the belief that as long as one takes one’s pills for blood cholesterol, blood sugar and blood pressure, one is free eat anything in any quantity. 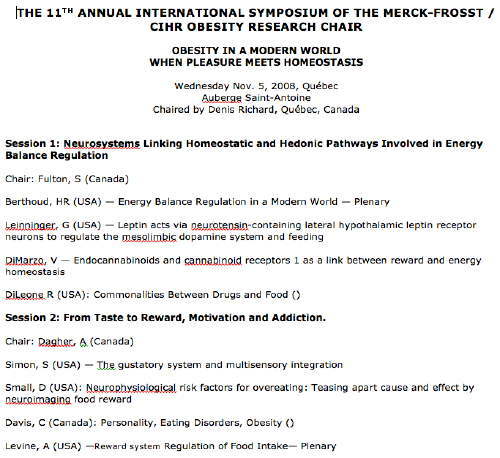 In this regard, we would hope that the sponsor of the symposium, Merck-Frosst, a peddler of pills for those very symptoms, realizes its culpability in contributing to the problem. La Presse reports the latest example of profiting from the cholesterol myth, this time from a restaurant chain famous for its poutine. Photo by Matt Saunders. 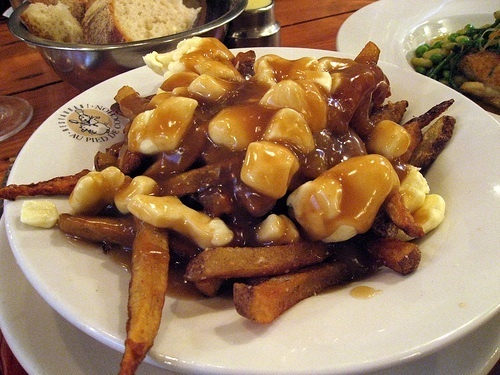 A typical plate of Montreal poutine. Can you see the fries buried under the cheese and gravy? This sign has been seen in many Lafleur outlets in the last few months. Less calories than a bowl of rice. Canola oil contains a larger amount of good fat than other popular vegetable oils like olive oil. A source of omega 3 and omega 6 essential for good nutrition and a healthy diet without cholesterol and trans fat. Let’s dissect this diatribe. We would agree that potatoes with the skin, baked or boiled, are nutritious but not particularly exceptional. They certainly don’t deserve the trashing they have gotten from the likes of nutritional morons like Montignac, Atkins or Taube who believe that calories from carbohydrates are poison and that calories from fat or protein are the only good calories. They ignore the fact that one’s brain needs 400 kcal (100 gm) of glucose per day. Potatoes many contain more iron than a bowl of spinach but have more calories for the same amount of iron. One certainly wouldn’t want to attempt to supply one’s requirement for iron by eating potatoes. We won’t argue about potassium but one doesn’t put salt on bananas and most servings of French fries, alone or in poutine would come with a lot of salt which tends to negate the benefits of potassium. The protein in potatoes is not a complete protein, like in animal products, and one wouldn’t want to rely only on potatoes for one’s protein requirement. One French fry may have less calories than a bowl of rice but a bowl of French fries has a lot more than a bowl of rice. Potatoes have very little fat but, when French fried, have a huge amount of fat. There is no such thing as “good” fat. All fat has the same calories, 9 kcal per tablespoon, the most concentrated form of calories. Now there are differences in the fatty acid composition of refined oils from various sources but there are no controlled trials showing these variations have any effect on prevention or treatment of any disease. High profit olive oil and canola oil are “good” because those selling them say they are good. There are lots of other sources of omega 3 and omega 6 fatty acids. No need to eat French fries. No vegetable food ever contained cholesterol but so what? Dietary cholesterol is not a problem. But the cholesterol myth has been so well implanted by the drug dealers that grease peddlers, like Lafleur, can use it to sell their junk. I hope Lafleur is paying royalties to Pfizer on every plate of poutine it serves. On the other hand, maybe Pfizer is paying Lafleur and its ilk to flog poutine so that people get obese and get “dyslipidemia” and Pfizer can sell more Lipitor to treat the “dyslipidemia”. Trans fat is the current politically correct explanation for all the ills of Western civilization including child obesity. It like all kinds of refined fat is totally useless empty calories but there is no evidence that it killed any more people than any other kind of refined fat. 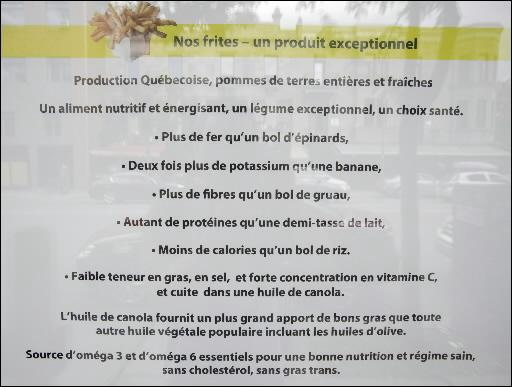 Most importantly, what is nowhere mentioned in the nutritional deception is that the vast majority of the French fries will be served at Lafleur as poutine in which the potatoes become a minor ingredient in the great globs of gravy and high-fat cheese. So Lafleur is really trying to sell more poutine by vastly exaggerating the importance of its only potentially healthy ingredient. 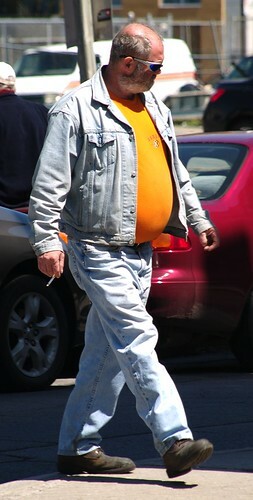 The appearance of a typical eater of poutine and a good candidate for a trial of a statin for "treating dyslipidemia"